It will make a lot more sense if you follow along in order. Here are today’s assignments. The second week of a unit is to spiral the unit’s focus, but also to spiral what we have learned in that domain so far this year. Mondays are all about Vocabulary. Our unit’s focus is Prefixes (Prefix Resources ), but I am also spiraling what we have learned so far this year: Similies and Metaphors, Proverbs, Idioms, Synonyms and Antonyms. We HATE the idea of teaching it and leaving it. We try to reference back to past units’ focuses whenever we possibly can to keep it fresh in their minds. When we focus on only one domain each day, it is a lot easier to do this!!!! This morning, students copied down these sentence frames. The sentence frames spiral everything that I mentioned above. 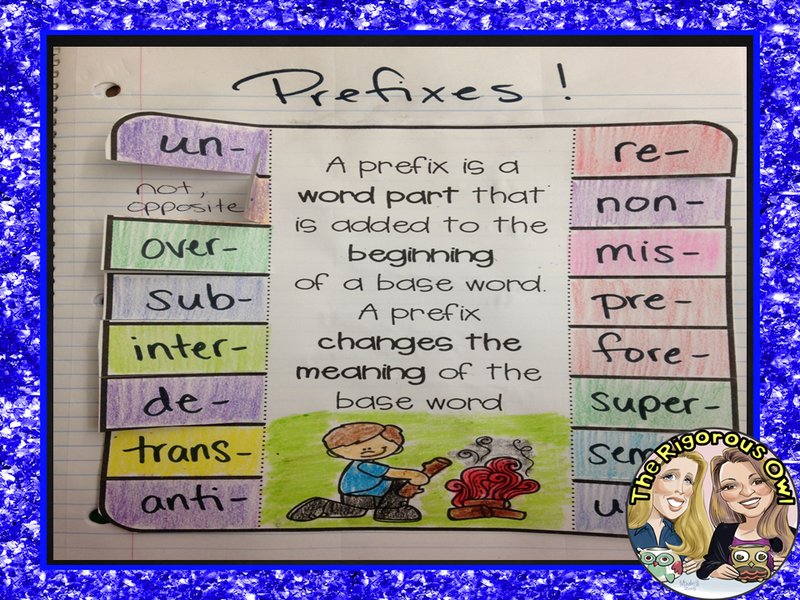 Here is how we reviewed our Unit’s Focus: Prefixes. Students wrote the meaning of the prefix under each flap. Them we colored similar meaning prefixes the same color to notice groupings and similarities. This also helps as they are studying! After Reader’s Workshop, students practiced their Root Words. Again, we use Got to Teach’s “Get to the Root of It. We love how easy she has made it for us! We cut out the practice from the worksheet and glue it into our Reader’s Notebook. We do one of these each day this week for practice. Students then completed their Vocabulary Activity. Their Vocabulary Activity is based off of their Dictionary Dig that they did on Friday Day 5. This student chose to do five words instead of three! Oh ya! Above and Beyond! In the Vocabulary Activity this week, students wrote the word, used it in a sentence, listed a synonym and an antonym, and drew a picture. This sums up Day 6! We hope that you were able to take something useful with you today to use in your classroom. We would love to hear any comments or questions you might have!! Day 7… What The Rigorous Owl Did In Their Reader’s Notebook Today!